This pendant features a design that symbolizes the geometry of the Heart chakra. It is a 12 pointed star which is cast in gold leaf and glow dust. The body of the pendant is cast with 23K gold leaf, crushed quartz and elite shungite. It is very effective at dampening EMF’s. This pendant is cast with a gold leaf and glowing Metatron cube design on the backside and inlaid with turquoise. Metatron’s Cube resonates with the highest force that can be imagined throughout all of creation. The design of 13 interlocking circles supersedes all other geometries including the Flower of Life and includes the five platonic solids in its layout. Metatron is the First Angel of Kether in the Tree of Life. In other traditions, Metatron is the “Scribe of God.” This design aligns the personal will to the divine plan. 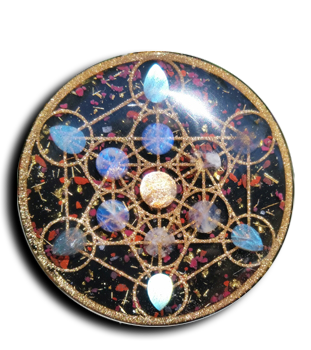 Orgonix orgone Pendants provide protection from electrical pollution and negative astral/psychic energies. Each pendant utilizes high quality crystals to alter the vibrations surrounding the person wearing the pendant. Depending on the kinds of crystals and the design of the pendant, each one will have its own “feeling” and qualities.